Not In Our Town Bowling Green celebrated its third anniversary with a reaffirmation ceremony on Oct. 17th. Bowling Green University (BGSU) staff, students, community members, and civic leaders, came together to acknowledge their commitment to NIOT values including: diversity, inclusion, and making the campus and city a safe and welcoming place for everyone. “It is our responsibility to make a difference and stand up against hate, to stop injustices and to push ourselves forward in the right direction,” said Amanda Dortch, president of the Undergraduate Student Government, from coverage in the Sentinel Tribune. Not In Our Town Bowling Green/BGSU started in 2013 after two racially-motivated hate incidents spurred students to come together and stand against hate on their campus. 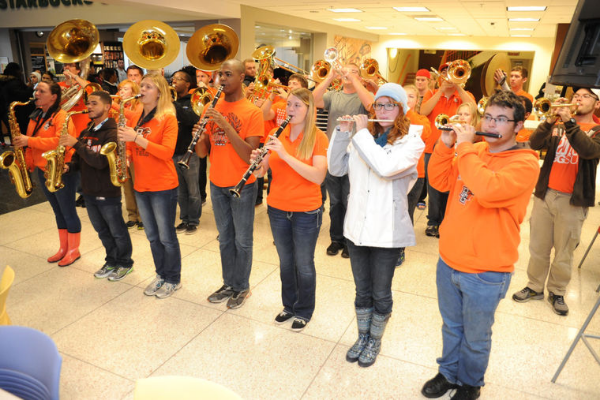 Leaders from the Black Student Union and the school administration organized community meetings and launched the campaign, which became a partnership between BGSU and the city. Among their list of achievements, earlier this year NIOT Bowling Green won the second annual ImpACT Awards: Putting Practice into Action for the Betterment of Communities. President Mary Ellen Mazey spoke about the accomplisments of NIOT on campus. Mayor Steve Edwards affirmed the City of Bowling Green's commitment to Not In Our Town, as one of five communities piloting the NIOT Gold Star City program. Barbara Waddell, Director of Diversity and Inclusion on the campus, and one of the founders of NIOT BG presented awards to Student Leader Amanda Dortch, Mayor Edwards, University President Mary Ellen Mazey, and NIOT BG Co-Chairs Gary Saunders and Leslie Galan. The event was live streamed for students and alumni across the country. Watch the entire video of the ceremony here.